a SP-01 Tactical, a Scorpion carbine and a 512 .22mag. All very sweet! That makes the Rami also very intriguing. It is 10 oz heavier and a 1/4" wider. Just wanted some feedback from people who have handled and shot both. I carry my Rami aiwb at 12:30 in a kydex or owb in Desantis speed scabbard at 4:00....both very comfortable and never any issues. FWIW: I am not a big guy, 5'8" and 155# . But I do alternate with an m&p shield which is , of course, a bit more unintrusive do to its much smaller size. I am sorry, but I can't help noticing how every response to the original inquiry thus far misses the mark. Don't you read the post first ? Since most people here are CZ owners, and are therefore among the upper echelon of firearms owners, few have volunteered to pay several hundred dollars to be one of SIG's thousands of beta testers. If you really want a P365 (or any other new SIG), you'd do well to wait a year or two for SIG to sort out all the bugs -- or cease production, as the case may be (e.g. the similar p250, 290, 520, etc.). evaluation. Maybe they rented one at the range. one may get their hands on one without shelling out the coin to purchase. I think that very much depends on the model. While I'm a CZ fan boy, I really really like my Sig P238. Can't go wrong with a mini 1911 platform. Truth be told, I'm carrying it more often than a CZ, due to the size (single-stacked .380). I got the HD model (all stainless). But while small, I think it feels heavier than a loaded PCR. I say feels since the scale says otherwise. Anyway, not all Sigs are rubbish. They do make a few good ones. The P238 / P938 certainly had their share of problems when they were first launched, that took a couple of years to sort out. So, Caveat Emptor, especially on new SIG models, though I've had my share of QC issues on established models in recent years as well. Also, SIG's automatic response to their own qc and design / mfg. issues is "shooter error," which tends to rub people the wrong way. For me size matters, but round count matters more. Give me RAMI, with a decocker and 14 +1 any day over the Sig. Btw, I love my lil P 238 as well. Best lil pocket pistol, even to the point of thinking about getting a P 938. I love CZs, so there you go. Headed to the range with my 365 in a few minutes and will report back. Shot 50 rounds through it Tuesday with no issues. I can tell you this, it's much smaller in hand than my Rami (obviously). Rami - smoother shooting, the extra weight really shows here. Trigger is better in SA, again as you would expect. Rami wins in the accuracy department, but not by much. If you said I could keep only one it would be the P365, just because it's better suited for the purpose of "deep conceal" carry. As much as the Rami is a great gun it's a chubby, heavy little joker. There you go, my .02. No argument here about the size, but looking at your target at 5 yards - was your POA at 8 o"clock ? The reason I ask is that with a point of aim at dead center, at 5 yards you should be close to X and your average POI is around 8 o'clock and that is not a very good accuracy at such a short distance. I see that often at the range, not the gun but the grip, trigger control, ie, the shooter. Yep, that is all me. Still getting used to the feel, plus was switching back and forth between the 365 and my new P320X VTAC. 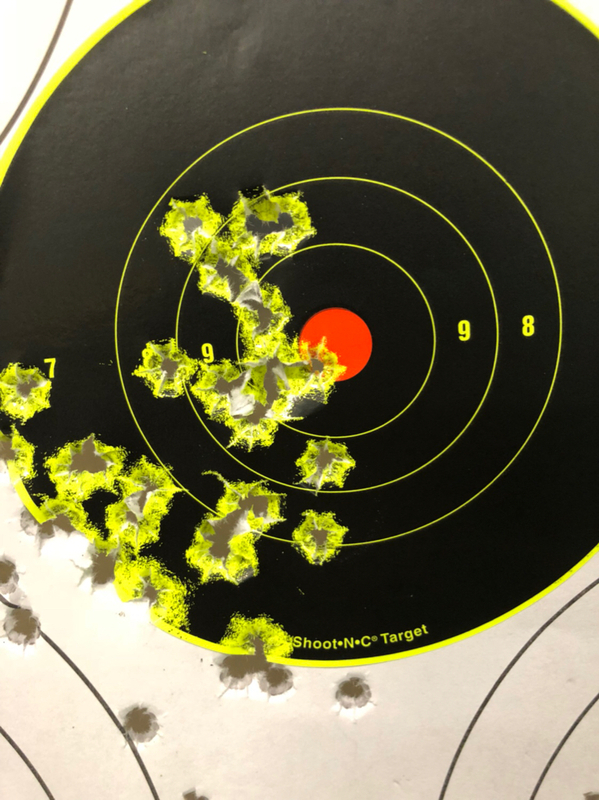 The low left ones were the first few ones on that target, the ones closer to the middle were me slowing down a bit and focusing on trigger pull.